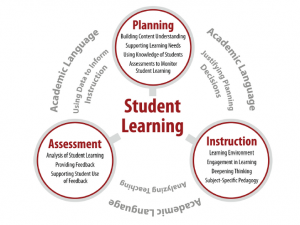 Hello, everyone, and welcome to another installment of Student Teaching from the Student’s POV! Instead of me ranting about my experiences via video (which I know you’re all going to miss), I’ve decided to write down my personal thoughts about the thing that is plaguing all education majors in New York State and beyond – The edTPA. 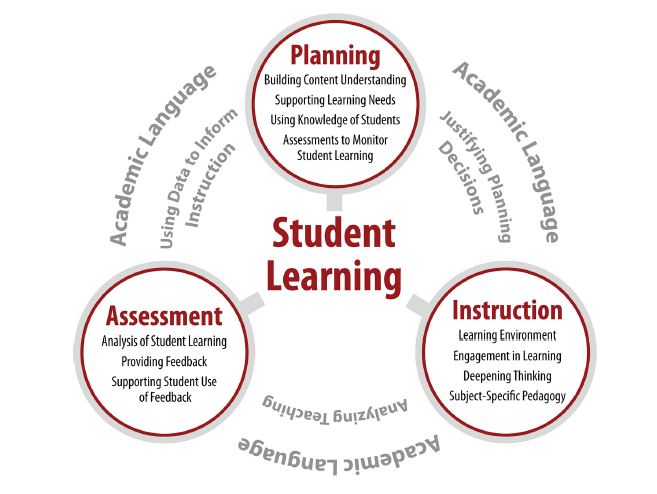 More specifically, the edTPA has three main tasks: 1) Planning for Instruction and Assessment, 2) Instructing and Engaging Students in Learning, and 3) Assessing Student Learning. 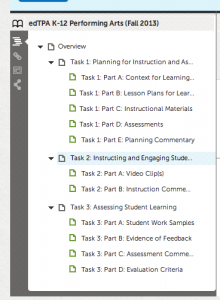 Each task has separate parts that must be completed, such as prompts, instructional materials, types of assessments, and video clips. Each task is very detailed, and requires teacher candidates to be very meticulous. Along with these tasks are 15 rubrics that must be completed. 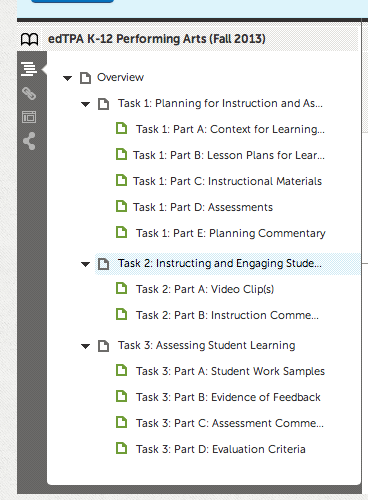 Each task has 5 rubrics that demand different things. In order to pass the tasks, a teacher candidate must get a 3 or higher on each rubric. If a student passes each task and rubric with a 3 or higher, then they pass the edTPA and can become a fully certified educator. Each Saint Rose Student must use Chalk and Wire in order to complete the edTPA. As you can see, the edTPA requires a lot of work and has many components. Each teacher candidate must put in many hours of hard work and dedication in order to pass this rigorous test. Moreover, each teacher candidate must videotape two ten-minute clips of themselves teaching in a classroom during their student teaching placement, showing them teaching the content and the students learning the content. At the end of the entire project, teacher candidates can walk away from a very detailed and impressive portfolio that will be sent for grading to a certified edTPA grader in the country. I’ve spent the past two months stressing over the edTPA. I have spent many hours in solitude pouring my very being into this portfolio, and during those long nights and endless days, I couldn’t help but wonder if it was all worth the stress and aggravation. Since my graduating class (May 2014) is the first class in New York State to do the edTPA, we have often been left scrambling for answers to questions that cannot always be answered by the Saint Rose faculty. To go even further, the amazing members of the Saint Rose Education Department (this includes the professors in the School of Arts and Humanities) have been working their butts off trying to get acquainted with this new certification test. Teachers and students alike have been trying to get the edTPA under control and get a better grasp on it. And, honestly, it’s stressful. All of the Parts that go with each Task has been completed! Now all I need to do is submit my edTPA to the graders and wait for results! As someone who would like to focus on Curriculum and Instruction in the future and who would like to become an Educational Administrator in the future, I cannot help but lean toward the positive side of the spectrum when thinking about the edTPA. While it is a lot of hard work, it is hard work that proves a teacher candidate is qualified to become a fully certified teacher. New York State is one of the top states in the country for education and, in my honest opinion, it’s about time we got on board with this program. The first year of any new system is always going to be stressful; it just so happens that I and my fellow student teachers have the pleasure of doing the edTPA first. But I cannot help but feel grateful to the edTPA for helping me become a teacher. Here’s why: I am more than a name on a piece of paper. When I teach in a classroom full of students, I become a completely different person. Genevieve is gone; Miss Diller, who is enthusiastic, peppy, and a tough cookie, takes over, and let me tell you, she is passionate about music and education. She loves teaching her students all about simple beat-keeping and rhythmic notation, and about how to find the beat in their favorite pop songs. Miss Diller loves making music with high schoolers who want nothing more than to close their eyes and make something beautiful together – music. Miss Diller wants nothing more than to fight for the rights of her students to be free to have a fulfilling education, one that won’t cut a program to fit budget needs, and one that won’t take away something that will ultimately give them joy. And, in the end, Miss Diller wants nothing more than to make a child smile and feel good about him or herself. Can an individual who is grading a standardized test on general information or even music content see this side of Miss Diller? No. They won’t even know what Miss Diller looks like. They’ll just see her name on the test that she took in order to become a music teacher, grade it, and use those scores to determine if she can be an affective and effective teacher. I am more than a name on a piece of paper. Before the edTPA, in order to become a certified teacher in New York State, you had to take three standardized tests: the LAST, the EAS, and the CST. These tests supposedly determine if you can be an effective teacher in a classroom. But what if you have test anxiety? What if you are sick? What if your number 2 pencil breaks, and you can’t finish your test? What if? I’m sorry, but I’m not basing my life on a what if. I am basing it on concrete proof that I am an effective teacher. That is what the edTPA is bringing to the table – it allows teacher candidates to strut their stuff and prove to seasoned educators that they can, in fact, teach. I am more than a name on a piece of paper. And the edTPA knows that. Yes, it’s a lot of hard work that causes a great amount of stress. But in the end, I know that when I pass this and my other certification tests, I will be passing because I am an effective teacher. I will be proving my worth through video clips, detailed prompts, and my many assessments of the students that I taught. The edTPA’s main components explained in this fancy chart. So is the edTPA worth it? In my opinion, yes. It definitely shows that a teacher candidate has what it takes to be a teacher, and it definitely tests our ability. I just know that at the end of this journey, I can walk away satisfied. Are you doing the edTPA now? What is your take on it? Let me know in the comments! ← Meet the grad assistants-Career Center style! Interesting thoughts, Genevieve. Honestly, I am still thankful I was certified under the old system (4 tests for me because of Spec. Ed.) because I do not feel I should continue to shell out $300 dollars to “prove myself.” And it’s my understanding that you still need to take 1 or 2 assessments on top of the edTPA, at $79 a piece. So the question is, is it worth it to pay more money for the same outcome that the old system provided… that is certification? However, I do agree with your points that the new system does make it more unique for you and isn’t just 100 questions on a test. Tests are monotonous!! It’s also interesting to note that the use of audio/video recording for teacher certification was done many years ago, but the state went away from it. It’s very interesting to see how things come full circle. Thanks for your feedback, Brendan! I definitely understand where you’re coming from; the expense did make my bank account cry. While I know consciously that this is another ploy for Pearson to make money, we cannot deny the appeal of being video-taped and showcasing our skills with this fancy portfolio. I wish we could find a compromise. And, just so you know, it’s 3 tests that are $79. So that’s a grand total of $537 to become a certified teacher nowadays. There are ways to video assessments of teaching without Pearson being involved. NYS has done a video requirement for certification. I am becoming a certified teacher in Illinois currently. I just completed my EdTPA, although it is not being sent to Pearson. Our college is in the process of fully taking over the EdTPA. On top of the $300 I would have had to pay for this if it was being sent to Pearson, I had to take 5 state tests because I am combined in elementary/special education. All of my tests were over $100 (most around $130) Add all of this up on top of my tuition and all other fees they tack on throughout the years. I even had to pay around $75 to get fingerprinted. Thank you for your positive comments! I also dislike the computer based tests, but I passed them all, so yay for me! I wish you luck with your edTPA and with your retaking of the EAS. I just don’t understand why this test costs $300.00. For what we are all going through, you would think they would raise the salary for these effective teachers who can pass the EdTpa. Thank you for your comment! I’m glad the University of Washington is on top of the whole edTPA thing (your college and my college should hang out). Because NY just got the edTPA this year, we weren’t able to practice as much; however, I foresee in the future Saint Rose picking up your college’s method of teaching the edTPA. As for the proving to Pearson that you’re probably an amazing teacher, I got nothing. It’s part of the state’s requirement to let you become a certified teacher. It’s not ideal, and I personally agree with you about it. However, I passed, and it’s over, and now I can go out and do what I love. You wrote: Each task has 5 rubrics that demand different things. In order to pass the tasks, a teacher candidate must get a 3 or higher on each rubric. If a student passes each task and rubric with a 3 or higher, then they pass the edTPA and can become a fully certified educator. I’m a bit confused and stressed over the whole scoring system still…In order to pass edTPA entirely, do we need to have a 3 or higher on every rubric? For example, if my total for a task is 3 but one of the rubrics is a 2 will I not pass? Hi! Sorry if that wasn’t clear, to be honest when I wrote it it wasn’t completely clear at the time. My understand is you need an average rubric score of 2.7 to pass. I got a few 2’s on some sections, but it didn’t stop me from passing with flying colors. I got a total score of 48, and the minimum to pass for Performing Arts is 41. I have a friend who got a 41.5 and he still passed, so there’s that. I came across your article searching for other opinions on edTPA, and I will tell you that I have found yours to be the most positive. I am currently in the process of going through the pilot program for the edTPA here in California. Since 2008, California has had a VERY similar assessment at the end of our teaching credential program called the PACT. This year, a select few of us are “trying out” the edTPA in replace of the PACT. To be honest, going through most of the program under PACT rules, it is all of the same stuff: videos, planning commentary, assessment commentary, context for learning, anonymous evaluation, etc. For the past six years (since the introduction of the PACT, which is what edTPA is really based off of), the program at my school has been nothing but a mess of stressed, overworked, and (I’ll use this term loosely) undervalued student teachers. Since the implementation of PACT, supervisors have made less visits because the state cut funding from that to put resources into PACT, student teachers receive less feedback on their student teaching, and all of the classes focus on “passing the PACT”. In my case it is the edTPA, but it’s the exact same thing. Regardless, this is only doing one thing: Teaching us to the test. We know as teachers that teaching to the test doesn’t effectively educate everyone, so why are they doing it to us? The other issue I have with these types of anonymous assessments is that they’re hypocritical. Both the edTPA and PACT bring up a very good philosophy of getting to know your students so you can teach and assess them efficiently and accurately. These are very great points that would have been talked about in my classes regardless, however what gets me is the evaluators that are grading you have no clue of who you are, where you’ve been, and the personal growth you have made. It just seems really unfortunate to me that our entire future can rest on 20 minutes of footage and commentary. I know you can retake it if you “fail”, but at that point it scares more future teachers away than it will help them try harder. I too am an aspiring music educator (instrumental/band to be precise), so it’s nice to know that there are others across the country going through the same process. These are just my two cents. I really appreciate your comment and agree with a lot of things. You are right – we are beginning to teach to the test. However, the student teachers have not been receiving less attention or funding because of the edTPA; rather, we are getting more attention because of it. Our faculty are bending over backwards to make sure that we have a handle on the edTPA as a whole. I know I wouldn’t have been able to pass without their guidance. The fact that this is all anonymous also bothers me, but I’m hoping that they got to see what they needed to see in my videos. I love my kids and would do anything for them. Hopefully they saw that (well they kind of did since I passed but you know what I mean). Hopefully they will resolve this issue in the future. At the end of the day, the edTPA’s goal is to make sure that effective teachers are going out into the world. You don’t need a test score to know if you’re a good teacher or not; you either are or you aren’t. Saint Rose has been focusing on this concept, and we’ve been able to thrive. Proving to Pearson that we amazing teachers is just an unfortunate step on the road to becoming teachers. I am also in the middle of this edTPA and I just completed it. Is there anyone out there who knows this edTPA very well and can review mine? (I’ll gladly pay) Is it ethical? I don’t see why not, I’m not asking someone to write it for me, just review and give me an honest opinion and where you think I may need changes.. I would ask my husband, but he doesn’t a thing about it. I think you’re not allowed to have someone review the entire thing, but if you want someone to look over your lesson plans or something that’s not too bad. My professors weren’t allowed to look over anything, but I let my friends skim my work. If you’re going to have someone review it, just be careful about it. I go to Nyack College in NYC, and my school created their own versions of the EDTPA, called a CPA (C stands for Candidate). This was extremely stressful, because they had us teach in our field experience, and the CPA became our final for literacy and Math methods courses. I would say it got us familiar with the test and the prompts. I am a December 2014 graduate, and I’m so nervous to take this test this Fall along with student teaching; However, I feel that my college provided me with the skills and practice to do well in this exam. I passed the CST and EAS, wish me luck on ALST. P.S I was just on the EDTPA website as well, and they are making changes to this exam due to responses and the feed back from everyone. This could be a good thing. Hello! I’m currently in a Masters program for Secondary Education in Oregon. We’ve adopted the edTPA as well. Although it has been a little stressful and overwhelming, I’m not scared of it. Not only is it assessing our ability to be effective teachers, but it offers us an opportunity to learn about how we can assess our lessons when we do become teachers in the future. These are essential skills! Hi! I am moving to New York from NV and muddling through all the requirements to become certified in NY. I have been teaching for 5 years and plan to complete my edTPA here before the move. It seems you have to register (and pay the 300 bucks) before you can even see the requirements (handbook?) of the edTPA, is that true? 1. There is no research that proves that video taping yourself determines “readiness” more than an actual evaluation by a person who is actually in the classroom. As far as Pearson is concerned, a student teacher could easily give kids cue cards and/or scripts that tell them what to say, all to prove that they are learning. 2. EdTPA is, in the purest sense, bad pedagogy. It is extremely distracting to the students to have a camera on them. Also, the student teacher must adhere to all the ridiculous rubrics and arbitrary requirements. Essentially, they are putting on a dog and pony show. Pearson is “measuring” us on “good” teaching; and yet, they have no problem invading the learning environment. 3. Pearson reaps all the benefits. I can honestly say, without hesitation, that edTPA has not made me a better teacher. In fact, I had to compromise many of beliefs to just jump through Pearson’s hoops. In addition to standardized tests (which I can’t go into), Pearson makes textbooks, learning programs, and even teacher strategy books. They alone (with the reviewers) see the newest professionals at their “best.” In other words, all the professionals with the most up-to-date training are demonstrating their best strategies and (un)freely giving that to Pearson. They basically can adapt what we have learned in college and use it for their own benefit. 4. Privacy concerns with the students. This one speaks for itself. 5. EdTPA distracts student teachers from real learning. As previously stated, it is merely a hoop to jump through. It is sad that these young professionals are spending their first year of teaching worrying about Pearson’s latest corruption. They should be focusing on personal growth, interactions with students, and polishing up their skills to enter the workforce. This is already the most stressful time in their lives. However, it is also the most exciting. EdTPA takes away from that. 6. Finally, the assessment is just bad. A test maker (you would think Pearson would have mastered this by now) should know that any assessment with a 150+ page rubric is a bad test. 15 rubrics? A testing handbook with a GLOSSARY? No. That is ludicrous.